Magnetic Screen Door only $5.49!! 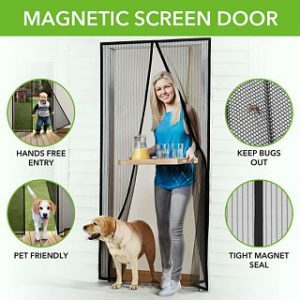 Magna Screen – the instant screen door – is $5.49 with Free Shipping – this is the cheapest I have ever posted it for (almost a winter clearance price!). We go through about two a year, mainly because I tend to rip the mesh with the laundry basket. Wonderful and work just as advertised. Been about five years now since we got the first. Order 3 or more and the price drops to only $4.99! If you’re in a rental without a screen door, these are fast and easy to install and do no damage.